Glasgow born and Cumbrian raised I live in the Lake District in England. It’s an interesting and ever evolving learning path and during my journey I feel compelled to share parts of it in the hope that I will inspire others to bring out their own latent talents. I’ve been a singer songwriter for as long as I can remember and I set foot upon the path of magic in my late teens embracing paganism and shamanism as the foundations upon which to begin exploration of the inner worlds of spirit. Initially my own Healing journey started at university in 2003 when I trained in Reiki while studying Media at the university of Cumbria. I was given a set of Tarot for my 18th Birthday so it has always been a big part of my life and I started reading tarot seriously for friends and classmates at Uni and never looked back. In 2004 I took the Reiki Master attunement and that changed my life dramatically. I have worked with hundreds of people on a one to one basis since then. Creativity is a way of life for me and my creations are like my other children and I release them out into the world with love. I have always wanted to help people and discovered upon growing up that there were terms for it like empathic, sensitive, healer etc which led me into studying and researching the Tarot, Qabalah, Astrology, Gematria, ancient languages and the Western Mystery Tradition. In 2013 I published my Soulscapes Tarot cards with a little white book of instructions. The process of creation of this deck was a priceless experience for me and I used this deck for the next 6 years when reading Tarot for others because it is my connection to that intuition, inspiration, wisdom, and guidance that comes from within. I have just finished creating my second Tarot deck the Initiates Way and alongside that I have created 22 pathworkings / visualisations to help students to explore the inner realm of the Tarot and use them not just for divination but as a spiritual Development tool. The Initiates Way book with these pathworkings will be published in spring 2019 by Mandrake publishers in Oxford. Music and Art are my lifelong passions. I run regular spiritual development classes, meditation circles and workshops using the Initiates Way Tarot and teaching Reiki. Three months have passed in the blink of an eye and much of it has been spent creating, painting, writing and gathering together my research notes for the Tarot Workbook that will accompany the forthcoming Initiates Way Tarot deck. If I thought that the journey of creating the Soulscapes Tarot brought with it major change and learning, it has transpired that the second time around of creating imagery for Tarot Major Trumps has brought with it immense wisdom, guidance and life learning for me personally and spiritually for which I am eternally grateful to have received . The creation of the Major Arcana paintings for “Art – Temperance” “Pan-Hermes-Devil”, “Ivory Tower – Tower of destruction”, “The Star Sothis”, “Sun”, “Moon” and the “Goddess of the Grove – Empress” has been an enlightening, sometimes frightening, awakening journey all of its own and a huge learning curve in terms of my current understanding of the Tarot and its uses. The images for the Initiates Way have arisen of their own accord from the depths of imagination like bubbles popping to the surface from the bottom of a deep lake. Even the method of painting has been so different from image to image. I started out using fingertips to dab and smudge block colour straight on to the canvas to paint the Wands / Staffs Court images and then to have gone on to watering the oil paint down with Olive oil and painting in layers on the Pan – Hermes – Devil, and incorporating metallic acrylic and indelible markers to define symbols. There is definitely something primal about the imagery that speaks to the subconscious rather than to the analytical mind. 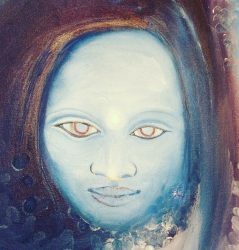 I will be taking some of the new Initiates Way paintings to show at the upcoming events at Morton Manor in Carlisle on the 2nd April and our Health Healing and Awareness Day in the Carnegie on the 9th April. Each of these images comes with a meditation to awaken that particular Archetype that has been written for use in a group setting or for use in ones sacred space during meditation, these will be published soon in book format as well as audio. I’ll be running workshops at the events using the High Priestess path working for anyone who wants to come and join in and learn how to use the Tarot for Meditation. Tarot is so much more than just just a tool for divination. It is your entrance point into another realm entirely, a journey within your very being and it is there waiting for you to set out upon its grand adventure.